Filed to: Julian Assange Who?Filed to: Julian Assange Who? WikiLeaks founder Julian Assange greets supporters outside the Ecuadorian embassy in London on May 19, 2017. Asked about Julian Assange on Tuesday while departing the White House on his way to Mar-a-Lago for Thanksgiving, President Trump feigned ignorance, telling reporters he doesn’t “know much about” the WikiLeaks founder, whose publication of hacked Democratic emails Trump praised repeatedly on the 2016 campaign trial. 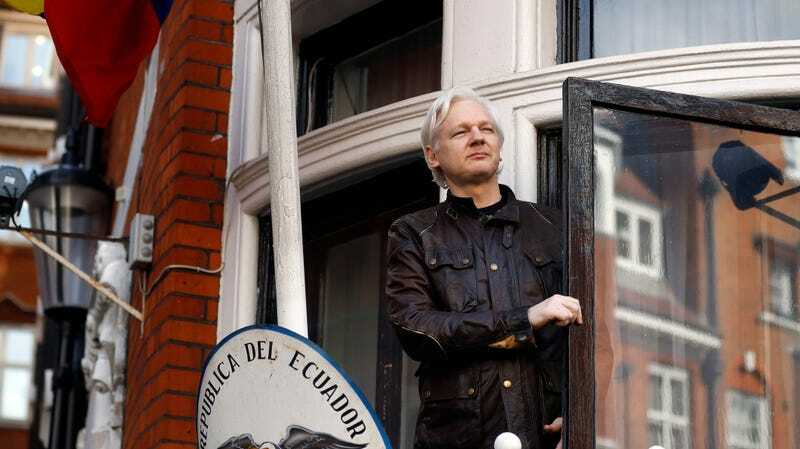 Trump’s remarks came less than a week after the Justice Department inadvertently made public information about a sealed indictment of Assange, who has been holed up in the Ecuadorian Embassy in London since July 2012 after the country granted him political asylum. The president’s attempt to distance himself from the former Wikileaks editor-in-chief is painfully hard to swallow. His praise of WikiLeaks was at one point a staple of his campaign speeches. “Boy, I love reading those WikiLeaks,” Trump lauded, in one instance, days before the November election. “WikiLeaks, I love WikiLeaks,” he also said at a campaign stop just a few weeks prior. Journalist Andrew Blake, who first reported on Trump’s remarks about Assange late Tuesday for the Washington Times, also shared on Twitter a video of Trump saying “WikiLeaks” over 140 times on the campaign trail. Private messages between the WikiLeaks Twitter account and Trump’s eldest son, Donald Trump Jr., were turned over to congressional investigators last year. In one exchange, the WikiLeaks account reportedly encouraged Trump Jr. to help convince his father to get Assange appointed an ambassador to the United States. The account also reportedly tried to solicit a copy of then-candidate Trump’s tax returns. Assange and his supporters—including, at times, prominent human-rights attorneys and high-profile media figures—say that exiting the embassy would likely result in Assange being extradition to the United States, where he may face charges related to his publishing of classified national defense information. As Gizmodo reported last week, U.S. authorities also maintain various records that detail collaboration between WikiLeaks and criminal hackers who targeted American companies and those of its NATO allies—activity that’s beyond the typical role of First Amendment-protected journalists or media outlets. Even among those soured by WikiLeaks’ publishing of Democratic emails stolen by Russian state-sponsored hackers in 2016—crimes for which more than a dozen Russian military intelligence officers have been indicted by the special counsel’s office—there are pervasive fears that Assange could be tried under the Espionage Act, which would set a dangerous precedent for publishers of information the government deems classified. An espionage case may prove challenging, however. Among other legal hurdles, it would require prosecutors to convince a jury that Assange not only knew publishing classified documents could harm the United States, but that harming the country was his specific intent all along. But Trump, who spent most of his campaign and his entire presidency thus far attacking the press, apparently doesn’t know anything about any of that.